Davenport Florida is a quiet little town nestled in Polk County, Fl. Its very slow growing population, in turn spells out a small and closely knit community. In 2000 the population was recorded at 1,925 and four years later the population stood at 1,994, adding only 69 residents to the count. Due to this fact, it does not have a large number of tourist attractions, but things are looking up for the town of Davenport, thanks to the presence and very close location of Walt Disney World. The economic infrastructure is growing, as immediate needs are met to house and feed the hundreds of thousands of tourists who come to the area to enjoy themselves on vacation, and spend time and money at the many tourist attractions that are currently available to them. Developers saw and answered the need for vacation/short term and long term homes. These special properties were and still are being built and purchased as investments from investors all over the world, in order to accommodate the special need of immediate and available housing for families on long holidays. Hotels, motels and all types of restaurants were thrown into the mix. The flurry of extra activity in real estate allows for more property taxes being collected. The local unemployment rate decreases as new positions are filled in order to keep up with the influx of new residents and tourists alike. Unfortunately, at this time, commercial enterprise has not caught on in the city of Davenport Florida. This may be a real blessing in disguise, as the residents of Davenport will not have to deal with excessive air pollution, which is usually generated by commercial plants; however, one never knows what the future will hold. Davenport Florida may not have an abundance of tourist attractions, but there are many such attractions just minutes away by car. Take a short drive out to the beautiful and quaint town of Celebration, (see our article and video on Celebration, Fl) During the Christmas Holiday Season, Celebration Town Center puts on a spectacular Snowing Nightly event. From November 27 thru December 31, snow falls at 6, 7, 8 & 9 pm, every single night, weekends included. Take a photo with Santa Claus, sing your favorite Christmas carols with the Strolling Holiday Carolers and try to keep up with the kids and have great fun on the Ice Rink! Universal Studios in Orlando, hosts Grinchmas at Islands of Adventure and the Gaylord Palms Hotel in Kissimmee, puts on an absolutely spectacular ICE Sculpture Show, by using 2 million tons of ice. You’ll be glad for the use of a winter coat or heavy sweater as you enter the beautiful and glistening igloo and especially as you wander through 18,000 sq. ft. of gorgeous ice sculptures. Visiting any of these beautiful attractions, at any given time of the year, is sure to add a lot of happy memories for your vacation photo album. If you’re a history buff and would like to learn more about the area, wander on down to Allapaha Avenue and visit The Davenport City Museum, located in City Hall. Ten miles out of Davenport you will find Walt Disney World, which consists of Animal Kingdom, Magic Kingdom and Epcot Center. When the weather is warm and you don’t mind getting wet, take a trip to Typhoon Lagoon and Blizzard Beach. 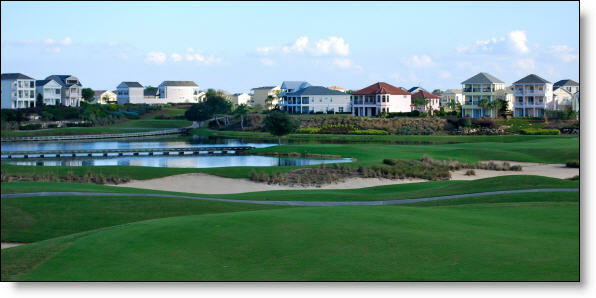 Golfers will not feel left out once they make their way to the 18-hole championship Providence Golf Course and Club. Described as a masterpiece, the course is definitely challenging, if nothing else. Mike Dasher, who is a renowned architect, designed the course so as to have it wander through flowing fresh water streams and to play hide-and-seek amid mature and lush landscapes. You may feel all alone out there, but you’re not. You have entered into a different type of neighborhood, whose residents don’t seem to mind your intrusion. Don’t be surprised if you come face to face with some of the local wildlife, herons and cranes searching for food in the water hazards, grazing deer, wild boar rutting among the dense bushes, shy otters and even a grouping of wild turkeys showing off their beautiful tail feathers. Remember, the only thing these particular residents ask you to take with you when you leave are your memories and to leave behind only your footprints. Many of the cities situated in Polk and Lake County represent what many humans search for as they head to Central Florida, a beautiful and serene setting where one can relax and enjoy the world of nature and everything it has to offer. The northern part of the United States endures extremely harsh and what seems to be never ending winters, but the lure of warmer climates can be felt loud and clear by residents who live and work in bustling cities covered with snow and ice. The small city of Davenport Florida definitely lends itself as a safe and peaceful haven from the cruelty of a long hard winter. Instead of scraping ice off your windshield in the morning, you could be sitting in the privacy of your back yard, enjoying your morning coffee and listening to the Cardinals and Blue Jays sing. Better still, instead of shoveling your driveway that has a foot of snow on it, head for the beach, where you can enjoy a barbeque with your friends and family, or take your best friend (dog) for a long walk. You can reach the sandy beaches of Tampa and the Gulf Coast in only one hour. Lake Tohopekaliga or Lake Toho as it’s sometimes referred to, has so much to offer. Hiking, fishing, boating, and skiing are just a few of the outdoor activities that are available. There are a thousand reasons why relocating to one of the communities in Central Florida is a great move in the right direction. Davenport, Fl. is a small town, but it packs a big punch. Besides being a terrific place to live and raise a family, it has what it takes to make it a tourist destination. Just minutes away from lots of fun and action, it true warmth and welcome are extended to anyone who visits, seeking a place of beauty, solitude and solace, away from all the hustle and bustle of the world that’s crushing down on them. Don’t have a lot of money for hotels or vacation rental homes; try the old camping tent and Coleman cooking stove. Davenport offers great camping grounds for old fashioned camping or for those who seek a little more comfort and security in an RV. Either way, make Davenport, Fl. your next vacation stop, and while you’re here relaxing and enjoying the gorgeous weather and beautiful scenery, think about how nice it would be to wake up to this paradise every single day from now on.